How to Use a Digital Meat Thermometer? 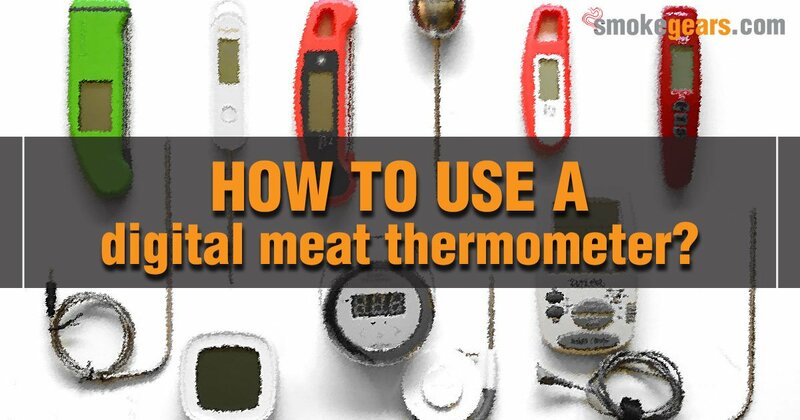 →How to Use a Digital Meat Thermometer? Grilling doesn't have to be complicated. Learning how to use a digital meat thermometer will eliminate the guesswork out of things. Whether grilling on the weekends, for competition, or for leisure, these are a few things to consider when putting a digital meat thermometer to use. When it comes to using the best thermometer for smokers, a digital meat thermometer is as good as it gets. But, there are many varieties. Some have a large face/display, some use LCD read outs, some rely on wireless technologies. Regardless of the thermometer chosen, first things first, you have to know the basics, to ensure accuracy in the readout. Whether using the best wireless thermometer or a wired digital thermometer, you need to properly insert the thermometer into the meat at a diagonal for accuracy in reading. You will place the probe in the thickest portion of the meat cut. For poultry, you will use the inner thigh for placement of the probe for most accuracy. Avoid placing the thermometer into contact with the bone. This will cause deviations in temperature readings. Avoid over insertion. You don't want to place the probe in the meat so deeply that it goes through to the other side. Keep the probe as close to the middle of the thickest portion of the meat as possible. Even with the best meat thermometer, inaccuracy in placement will result in off-readouts or errors in temperature readings. So make sure you are properly inserting the probe when taking the temperatures of meats you are grilling. When inserted, read the initial temperature the thermometer is saying. You will want to give yourself at least 30 to 40 seconds after this, for the actual "accurate" temperature to be flashed on the thermometer. At this point you will notice the temperature will stop going up, and a more stable reading is visible. This is as close to the actual temperature you are going to get when reading the thermometer. You want to allow the internal reading to reach about 1 to 2 degrees F lower than the desired internal temperature. Why? Because it is going to heat up a little more on the grill when you remove it. At this point you are ready to remove the meat from the grill as it is safe for consumption. You will also find this avoids over searing. So your meat will remain juicy rather than dried out. When grilling on a larger roast, you want to remove the meat a little earlier as well. When it is about 5 to 10 degrees F below the desired temperature is a good point for removal. The reason is that the internal temperature will keep rising for a few minutes after you remove it. Therefore it will reach the desired temperature before you consume the meat. When using meat thermometer, you shouldn't run into errors in reading. Again, as long as proper placement of the probe (in the thickest portion) is done, you won't have inconsistencies. You can use the thermometer to test other foods prior to grilling. Use it on something which has a precise temperature (for example your oven/stove) and see what it says. This will give you an idea of how close the thermometer is to the actual temperature settings as well. Depending on if you have a double or single probe thermometer will also dictate how it is used. You are always going to place it in the thickest portion of the meat you are grilling. However, depending on how the grill is set up (where meat is) you might want to use varying angles for probe placement. This simply ensures one reading (from one meat) won't crossover to the other probe. Depending on whether you are using a wired or wireless thermometer, there are also some changes in reading the output gauge. With wireless, you might have further deviations (about 3 degrees F) from the actual reading. So make sure you familiarize yourself with the thermometer prior to grilling, for the most accurate reading when grilling meats. Your wireless thermometers are going to have several settings. And, you can choose from different types of meat on the LCD screen. Choosing the right meat reading, will ensure the most accuracy when grilling. So also keep this point in mind when using a wireless thermometer for grilling purposes. Depending on the type of thermometer used, you might have special features or functions in place as well. This is more so the case when using a wireless thermometer. It is important you understand the features, how to use them, and how to set up your thermometer. All of this will ensure the most accuracy and closest temperature reading, when using it for grilling purposes. Of course you have many grills with a built in thermometer. But these provide you an estimate as opposed to an actual value. The benefit of the thermometer is the simple fact that you insert it directly into the meat. So you are going to get as close to the actual temperature as possible. Although it is not required, it is the best way to ensure you have the proper temperature readings when grilling different cuts and types of meat. There is no guesswork when it comes to using a digital thermometer. The biggest differences come in wired versus wireless so you should familiarize yourself with the features for the type of thermometer you purchase. Apart from this, it is virtually error proof when properly used for grilling purposes. Regardless of what you are grilling on a best smoker, a thermometer will ensure accuracy in temperature readings. Therefore, learning how to use a digital meat thermometer is the first step in the process. These are a few of the simple factors you should consider when using it for grilling. With the right thermometer, you will have properly grilled meat for safe consumption. And, you can avoid over grilling, to avoid overly rough or dry meat off the grill.